Learn how to create an amazing surreal portrait in Photoshop using abstract shapes. You can create interesting kaleidoscope portraits with this technique, using other shapes and images. There are unlimited possibilities to create abstract portraits so basically your imagination is the only boundary. I hope you will enjoy our new Photoshop tutorial. Open a new PSD file called "surreal-portrait.psd". Copy this portrait image into your file. Call this layer Portrait. Right click on the Portrait layer and choose Duplicate Layer in a new PSD file called "surreal-effect-1". For this tutorial I will use this Kaleidoscope Abstract Effect Photoshop Action ; inside the pack that you download you have an ATN file and a CSH file that you have to install. First you have to load the action in to your Photoshop actions tab. So open the actions tab by going to Window>Actions menu. Or you can simply press ALT+F9. And simply load the "KALEIDOSCOPE-by-PSDDUDE.atn" action file. In the same pack you have an CSH file that contains custom shapes. In Photoshop go to Edit>Preset Manager, change the Preset Type by choosing Custom Shapes from the drop-down list. Click the Load button and choose the "abstract-shapes.csh" file. Let's return to our PSD file called "surreal-effect-1". Pick the "kaleidoscope" action and click Play selection button. The action stops with this message: "Add a custom shape for the kaleidoscope mask effect! Resume Play!". So pick the Custom Shape Tool and from the shapes list choose the "diamond" shape. Draw the shape inside the "add a custom shape mask" layer like shown in the image. Resume Play the action from where it stopped. The action stops again with this message "Drag and Drop the image to reposition it! Resume Play!". You can move the "(YOUR IMAGE)" layer to your liking. Now go to the Layer menu, choose Rasterize submenu and click on the Rasterize All Layers. Now go to Image>Trim and make this settings. Now you have to resume playing the action from where it stopped and to wait for the result. Select the "normal size" and "small size groups" and merge them(press CTRL+E). Call the resulted layer Kaleidoscpe Effect 1. Return to the initial PSD file("surreal-portrait.psd"). Right click on the Portrait layer and choose Duplicate Layer in a new PSD file called "surreal-effect-2". Repeat the same process (Part1-step5 till Part2-step5). The only difference is that you have to use an Ellipse Tool to cover the mouth area. Hide all the groups/layers from the result except the "large size" group. Inside that group keep only the "41 copy", "31 copy" and "2 copy". Select the "large size group" and merge the layers inside(press CTRL+E). Call the resulted layer Kaleidoscpe Effect 2. Return to the initial PSD file("surreal-portrait.psd"). Right click on the Portrait layer and choose Duplicate Layer in a new PSD file called "surreal-effect-3". Repeat the same process (Part1-step5 till Part2-step5). The only difference is that you have to use an Ellipse Tool to cover the eye area. And also do not Rasterize the layers and do not use the Trim image. Select the "large size group" or the "normal size group" and merge the layers inside(press CTRL+E). Call the resulted layer Kaleidoscpe Effect 3. Now copy all the layers Kaleidoscpe Effect 1, Kaleidoscpe Effect 2 and Kaleidoscpe Effect 3 in the initial PSD file ("surreal-portrait.psd"). Place the layers like in the image, replacing the head of the man with this new surreal abstract montage. You can move, rotate, resize the layers to fit with your canvas proportions. For the final touches you can sharpen the image with the High Pass Filter for a cool look. To obtain a grunge effect you can use an old paper texture for example. Set the Blend Mode to Multiply and the opacity to around 50% or less. So here is the final result for the surreal kaleidoscope portrait made in Photoshop using this useful Photoshop action. 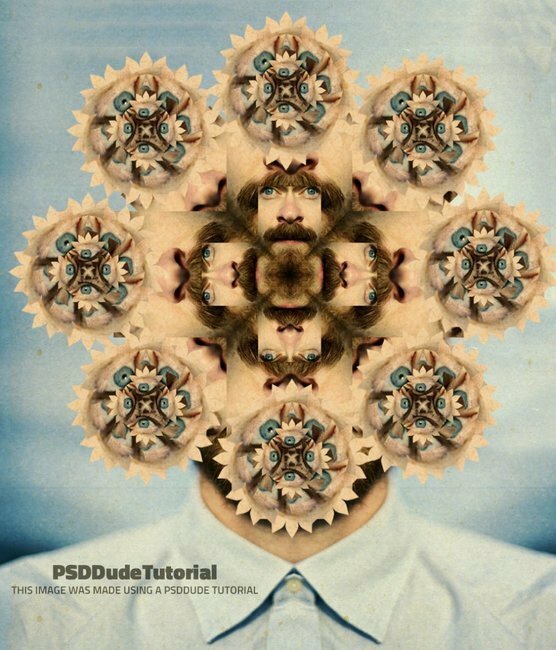 2 comment(s) for "Surreal Kaleidoscope Portrait Photoshop Tutorial"